Some call them bao, some call them steamed buns and some (us) call them fluffy filled pillows of happiness. Whatever name you christen these tasty creations with, you’ll be pleased to hear that Auckland dishes them out in bulk. From pork belly buns to make-your-own versions, we’ve eaten our way around Auckland to find its best steamed buns. You’re welcome. While its funky fit out, buzzy vibes and friendly service makes this Mt Albert restaurant one of the best in the area, it’s the gua bao that reels in the masses. Chinoiserie’s line-up of steamed buns features Szechuan seared chicken, satay tofu, sambal fried squid, pulled beef cheek and the favourite of the bunch—braised five spice pork belly with Gong (a.k.a. crack) sauce, bok choi, coriander and peanuts. And, at just eight bucks a pop, they’re a total steal. 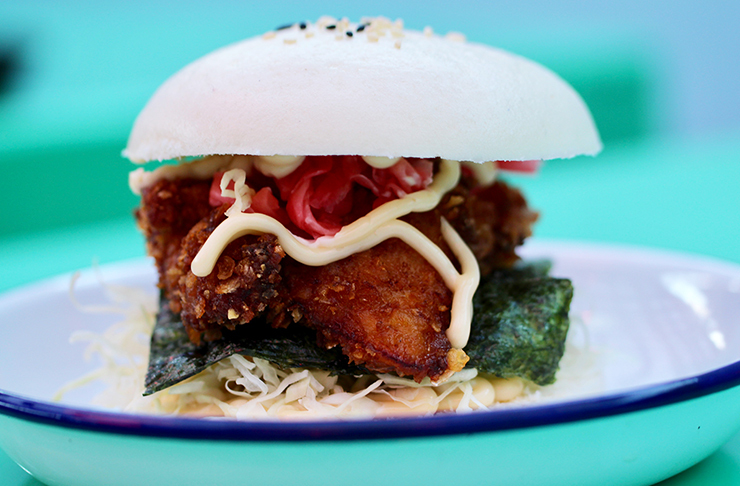 These guys take steamed buns to another level by bringing it to us in burger form. The steamed buns replace regular burger buns makes it a 10/10 pillowy, fluffy experience—especially when paired with their juicy pork. Happy Boy has tons of different options when it comes to their steamed bun burgers. Vegetarians, do us a favour and try their tofu, thank us later. Happy Boy really do serve up some of the best steamed buns in Auckland. 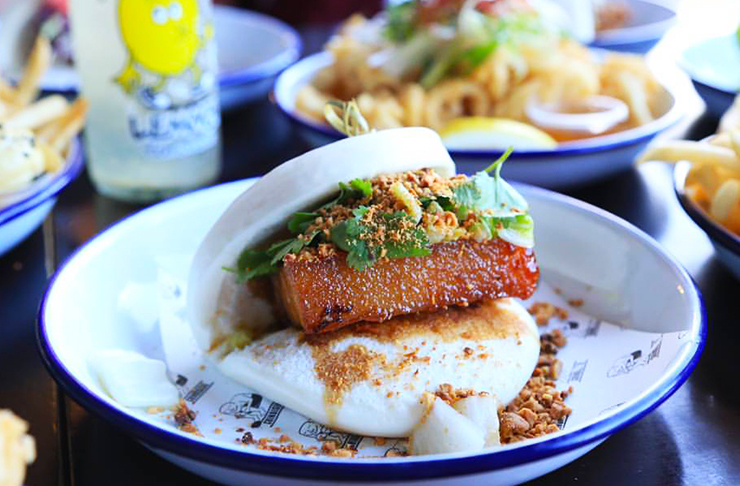 This newly opened Viaduct restaurant has jumped on the steamed bun frenzy with Chinese roast pork belly and chicken karaage gua bao. Whichever one you decide to sample, you’re in for a treat at White + Wong’s. Grab a Blushing Buddha cocktail to turn your bao adventure into the start of a night out on the town. If you wanted something more OG, you can never go wrong with the steamed buns from Nice Dumplings. These guys provide the king-sized versions of classic vegetable buns, pork buns and a sweet red bean bun. Not only do they taste the bomb but they’re super cheap which makes them a staple for Auckland uni students. Home to Pan Asian cuisine in Penrose, Big Fish Eatery dishes out puffy edible envelopes and you’re gonna wanna try them. They slow cook their pork belly for four hours before chucking it into a bun with lashings of hoisin sauce and mayo. More of a chook person? Their lemongrass chicken bun with have you bao-ing down at first bite. 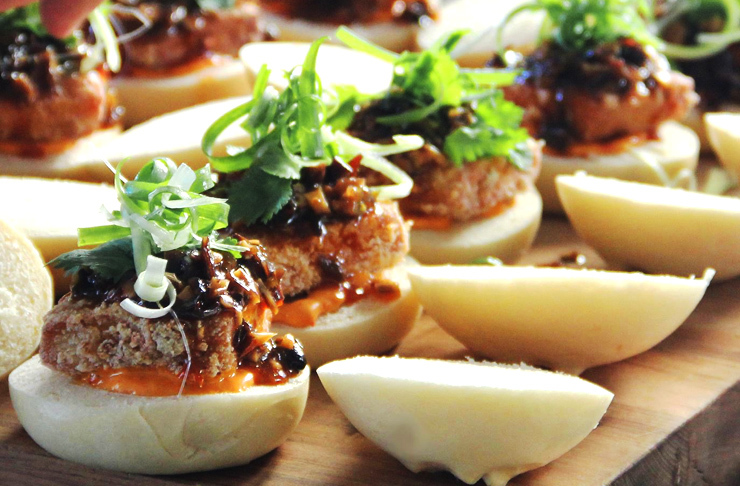 Judge Bao collides burgers with bao and we’re inclined to call them ‘baogers’. Swaying from the traditional clam-like look, Judge Bao’s bao feature a round, handmade steamed bun cut in half and filled with all manner of deliciousness. We’ve got a soft spot for their Dirty Bird with Guangzhao chicken, pickles, napa, corn and sriracha but pork belly lovers should get amongst their Little Eddie—Shanghai braised pork belly with peanut, hoisin and coconut sugar. Mmm, mmm! Brisket is having a moment and the fact that its collided with bao has made us (and our bellies) pretty damn chuffed. Chop Chop’s smoked brisket bun will get you fired up with the addition of kimchi and Deputy Chang’s crazy hot sauce or settle for some seafood via the soft-shell crab, creamed corn and coriander bun. There’s also a pork version if that’s your jam. People go cray for The Blue Breeze Inn’s buns and we don’t blame them. A hunk of crackling-heavy pork belly is nestled within a soft steamed bun alongside pickled cucumber, coriander and a finger-lickin’ sweet sauce. They also have crispy tofu buns so you vegos don’t get FOMO. Birkenhead restaurant Mulan affectionately name their steamed buns ‘Mama’s Special’ and, since mamas always know best, you can be sure they’ll be good. With the choice of succulent, sticky pork and flavour-packed Thai chicken, it would only be fair to try both, right? The answer is yes. Make sure you do. If you ever find yourself rocking about Britomart, make a bee-line to Lucky Buddha for their sriracha roasted pork buns. The buns come straight out of the steamer before entering a marriage with hoisin, spiced peanuts and fresh ‘erbs. Seriously top stuff. Have you ever had a AYO TacoPao? No? Hop to it! Nanam in Takapuna will provide you with the satisfying experience of assembling your own buns. But these ain’t no regular steamed buns. They’re hot pink and, when filled with sticky pulled pork, chicharron and homemade pickles, they’re almost tooth pretty to sink your teethies into. It’s possible to be obsessed with steamed buns and y’know what? That’s a-okay. 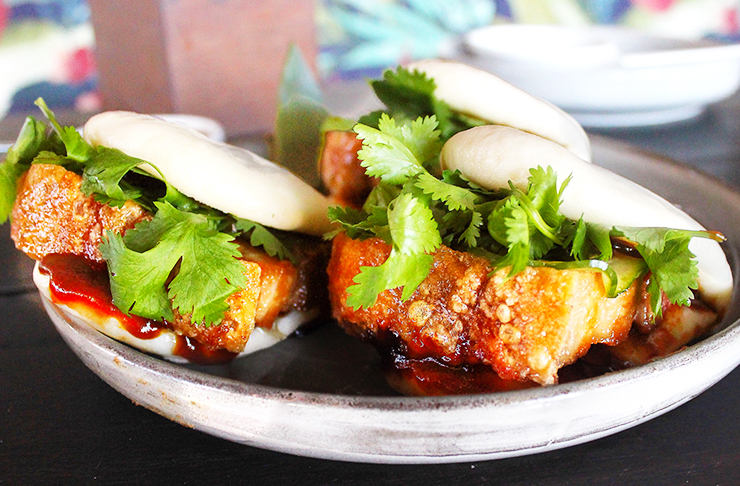 Herne Bay Japanese restaurant, Janken fuels our addiction with their soy-glazed pork belly and teriyaki tofu buns. The pork is free farm and the tofu is organic so you’re guaranteed to not munch on any nasties. This dinky Britomart bar is Auckland-famous for its creative, Japanese-inspired cocktails—The Brown Sugar Sipper, Fukuko’s take on an Old Fashioned is our fave—but they also put together a mean steamed pork belly bun. Order it with the fried chicken for the ultimate bar snack duo. Is all this pork belly chat making you hungry for more? Here’s Auckland’s Best Pork Belly Everything.